A simple salad made with juicy oranges, fresh mint leaves and sweet fennel. Pack away and enjoy as a quick and light lunch at a picnic or brunch outing. While pasta is the ideal canvas to explore Italy’s regions and ceviche is the perfect food for discovering Spain’s – fresh fruit is the quintesential Californian experience. The agricultural hub that is California leaves you with an abundance of fruit, all exuding the taste of each passing season. While in Italy, I had a salad that evoked the freshness of the season - a winter orange salad. Traditional to Sicily, this salad is light enough to be enjoyed before pasta or as a refreshing ending to a full meal. To rework this Sicilian classic, I’ve added thin shavings of sweet fennel while dressing it with cooling mint leaves and lemon juice! The beauty of this dish is in the inherent way fruit captures the goodness of each season so perfectly that you only need a few ingredients to create an utterly delicious dish. 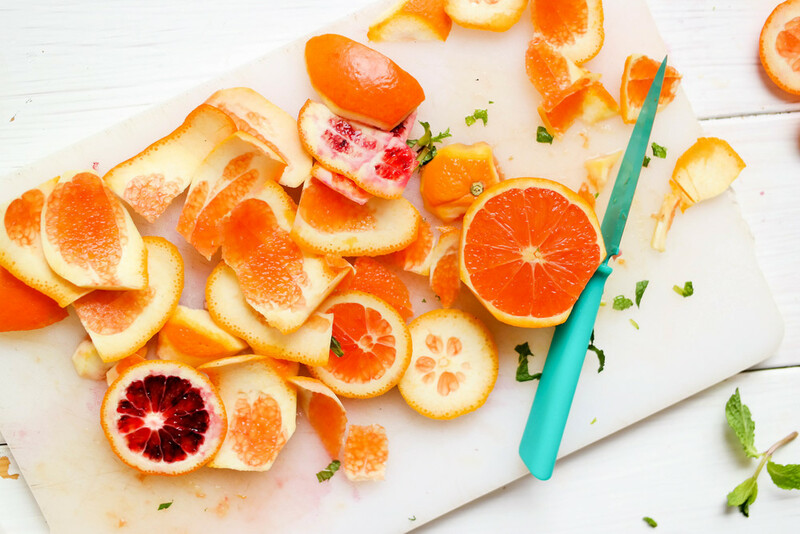 The citrus of blood and navel oranges are balanced by crisp fennel and mint leaves, bringing about a sweet freshness to the salad. It gets even better as it rests in a simple dressing of freshly squeezed orange and lemon juice. This is seriously nothing less than mouthwatering as each bite is wrapped in a juicy sweetness that speaks to the approaching season. It is a simple salad perfect for a spring picnic or Sunday brunch. It’s saturated in taste, beauty, and color, and exudes a carnal taste of the earth that only fruits of the season can. Thinly cut the oranges horizontally as you would a cucumber – cutting about 5 large circular orange slices. Cut the bottom and top off the fennel and peel back the outer layer and discard. Then thinly chop the fennel just as you did the orange – creating little rings. Squeeze the orange and lemon juice into a small bowl and toss in the roughly chopped mint leaves. Pour on top of the orange and fennel salad and enjoy! I hope you enjoy this simple salad! I cannot express how delicious it really is - I couldn't stop myself from eating the entire plate, borderline addicting. I know you'll love it as much as I do!